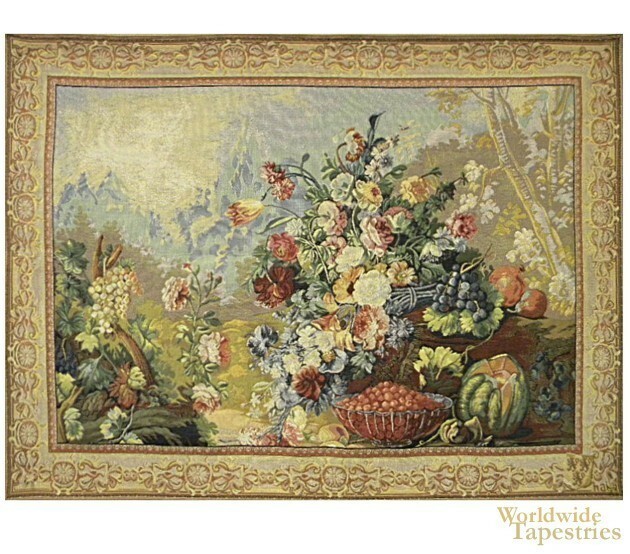 Bouquet D 'Arlay I tapestry shows a bouquet of flowers and fruit in the style of 17th century floral art. Here we see flowers in full bloom and fruit such as melons and raisins. Flowers and fruit were the topic of still lifes through the centuries to bring the feeling of nature indoors. The Bouquet D 'Arlay tapestry is backed with a lining and a tunnel for easy hanging. Note: tapestry rods and tassels, where pictured, are not included in the price. Dimensions: W 36" x H 27"